Are you a writer who has written a memoir that provides an engaging account of a key moment in your life, perhaps from childhood, or when you were a teenager, or a time that may be as recent as just a few years? If you’re now looking for a publishing house, we’ve put together the perfect list of publishers for you. 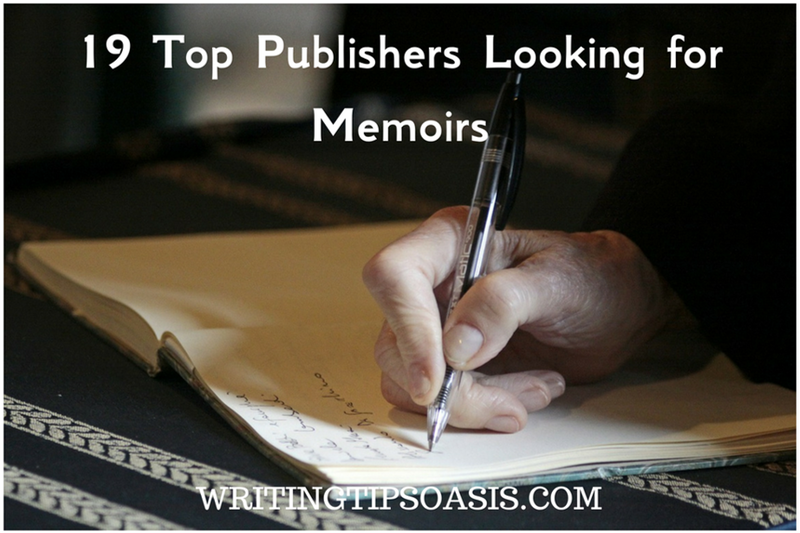 Below you’ll find 19 top publishers looking for memoirs right now! Michael Braziller and Karen Braziller launched Persea Books in 1975 to find, print and encourage new and innovative writers and authors in fiction, non-fiction and poetry. The 50 year old literary publishing house is named after a celestial tree celebrated and respected by ancient Egyptians. In their quest to promote quality literature, they have constantly published authors and writers with a voice that challenges status quo. A different style of narration, vibrant characters and poetry that transcends generations is just some of the qualities they seek in their authors. The New York based publisher is presently seeking novels, short stories, memoirs, biographies and Young Adult novels. You can write a query letter to them via post or email after reading the submission details and guidelines on this page. Ross Humphreys and Susan Lowell established Rio Nuevo in 1999. Choosing to focus on West and the local history, culture, food, nature and travel, they are located in Tucson. The ability to portray local culture so intimately and creatively has led them to win awards and reach bestselling lists in the country. They are interested in art, nature, history, travel, photography, biographies and memoirs. Interested authors and writers should send a query letter first before sending their manuscript. If they haven’t replied within 30 days to your query, you should consider your idea rejected. Find the instructions mentioned here. This iconic book store and publisher is reputed across America for its vision and zeal towards books, literature and offering a visible platform for struggling writers. City Light Books was started in 1953 as a book store by Lawrence Ferlinghetti and Peter D. Martin and eventually started publishing books in 1955. Allowing local readers, lovers of literature and curious tourists a safe place to discuss opinions, books and the nuances of writing, City Lights in San Francisco used its fame and popularity to print and promote selective but strong works of literature, both fiction and non-fiction. With 200 titles in print, City Lights Books is looking for poetry, essays, fiction and memoirs. They request you to send a book proposal by post instead of a completed manuscript. Read the guidelines mentioned on this page for further details. Writers and authors will have to give them six months to reply to your proposal. Primarily a non-fiction publisher, Ben Bella Books was established in 2001. This publishing boutique wants to provide useful, valuable life advice, guidance, stories and experiences from business leaders, celebrities, experts and writers. A concise, focused approach to marketing and promotion has enabled them to have 14 bestsellers in the non-fiction category. Taking their commitment to society a step ahead, they publish books about special books under the ‘BenBella Cause’ program and half the book profits are donated to the cause usually associated with the book or the author. Cookbooks, business, marketing, diet, health, memoirs and biographies are some of their preferred categories. Their guidelines for pitching a manuscript are very specific so please read them carefully before sending your proposal. Traditional publishing houses will not go near offbeat subjects or writers who have a unique story to tell. That’s where Unnamed Press steps in. This small, independent press is perfect for the quirky, unconventional and multi-faceted writer who wants to break tradition and do something new. Their title list is eclectic and their authors are diverse minded people with strange stories. The boutique publisher doesn’t seek any particular genre but wants to be moved, impressed or humored by your story, writing style and characters. The easygoing Unnamed Press doesn’t even have any submission guidelines or instructions for memoir authors. You can just send a query letter to them via email. They will only reply if they are interested in the book proposal. Another small and independent publishing house printing quality literature, C&R Press has been in the business since 2006. Committed to keeping the art of books alive, they have embraced new media but want the essence to remain the same. Like their small press has grown over the years, they don’t shy away from accepting new and raw writers and authors who need polishing and refining to be ready for the readers. Fiction, non-fiction and memoirs are some genres they want to add to their titles. In a world where different voices are repressed, C&R want authors of color, LGBT orientation and female authors to shake things up. You can read the guidelines here and use the form on the page to submit your manuscript. Established in 1987, Camino Books chooses quality over quantity by only printing 6 to 10 books a year. Focusing on the Middle Atlantic States, they want local and regional authors to write about travel, culture, food, biographies, memoirs and history. They have also printed books about health and nature previously. If the subject resonates with them and provides a unique insight, they will consider it. They do not publish fiction or poetry. Their submission guidelines are quite straight forward. Camino Books requests you only submit your manuscript if you feel your story can be a good fit by glancing at their previous titles. You can find the submission guidelines here and the address is available on this page. Dominique Raccah decided to start Sourcebooks in 1987 to use her knowledge as an advertising professional to build a business that can make a difference. Her keen sense of consumer understanding enabled her to sign authors and writers with strong voices and impressive stories. From a how-to book publisher to now a digital, innovative and promising publisher in the country, Sourcebooks has come a long way. With imprints that have published bestselling books and a constant dedication to finding interesting authors, Sourcebooks has maintained its position as an important publisher of non-fiction, memoirs, fiction, children’s books and young adult. You can find their guidelines to submit non-fiction mentioned here along with the contact details. A small and independent publisher, Black Mountain Press was formed in 1994. Eager to find unconventional literature that is often ignored by the big publishers who only want mass and cliché works, Black Mountain Press bats for the disruptive voices. First time authors or authors without an agent get a raw deal and this boutique company wants to collaborate with them to create works of art. Ignoring best selling lists or awards, they prefer stories and ideas that engage the reader and include them in the story. From 2018 to 2028, they will have an open reading period for poetry, memoirs, novels and collections of short stories. You can find the submission guidelines listed on this page. Use the Submittable form to send your manuscript to the Asheville based publisher. A big, traditional publisher with an exciting catalog of titles, Sterling Publishing is located in New York. With years of publishing experience behind them and almost 5,000 titles in print, they have impeccable marketing, editing and promotional capabilities. Printing a varied range of genres such as fiction, non-fiction, cooking, health, memoirs, children’s books, literature, humor, lifestyle, wellness, travel, music, sport and nature, they have many bestselling authors in their list. They do not accept electronic submissions. Their different imprints focus on different genres. Address your mail to the appropriate editor or the letter may go unread. Find the submission guidelines and postal address mentioned on this page. Kate Gale and Mark E. Cull formed Red Hen Press in 1994 in Los Angeles. A literary press with a purpose, Red Hen Press prints books with strong messages and also encourages literacy and reading in schools and communities. Its commitment to keeping creative storytelling, unique literature and voices is remarkable. They have 8 imprints, dedicated to different styles and genres. The nonprofit literary organization is interested in authors of color, female authors, immigrants and anybody with a story to tell. A selective publisher, they only print 20 books a year. Writers should familiarize themselves with Red Hen Press catalog before submitting a manuscript. Writers of poetry, non-fiction and memoirs can send their manuscripts using this online form. Kensington Publishing Corp was started in 1974 in New York. A family owned publisher, they have managed to brave all the ups and downs of the publishing industry with their forward thinking and clever choices in writers and authors. Priding itself on being an independent publisher in US, Kensington publishes 500 titles annually. The various imprints of Kensington also publish a wide range of genres including but not limited to fiction, non-fiction, poetry, biographies, memoirs, romance and young adult. The beauty of Kensington is that it combines the marketing and promotional reach of a big company with a creative bent of a small and boutique publisher. Writers and authors should only send a query to the publisher via email. The submission guidelines are specified on this page. Located in Texas, Bright Sky Press is a small publisher with big dreams. A full service publishing company, Bright Sky wants to find authors and writers with dynamic talents and irreverent stories that can stand out among the clutter in the market. They have printed books that have topped bestseller lists and won awards all over the country. Bright Sky is eager to print and publish books that manage to raise awareness about crucial issues faced by the region and the country. They publish only 20 books a year so ensure your manuscript meets all the required criteria. If you want your material to be read by them, do send your manuscript via post. The detailed instructions to submit a manuscript can be found on this page. Peter Carlaftes and Kat Georges established Three Rooms Press in 1993 to promote and print avant-garde literature and writing. A radical publisher who does more than just print books, Three Rooms Press also creates and produces plays, events and concerts. They hold regular readings and workshops to encourage the love of books in the city. Situated in New York, Three Rooms Press is seeking fiction, memoirs, biographies and LGBTQ romance. The publisher requests you to send a book proposal and not the full manuscript. Writers and authors will also have to provide a marketing plan for the promotion of the book and how they can add value to the publicity and marketing campaign. Find the details on this page along with the email address to send your book proposal. A digital first publisher, Regal Crest is a modern company with a forward thinking vision. Printing books only if the story or the book demands it, they have adapted to the technological advances very well. Their philosophy is evident in the books they choose with engaging storylines, characters that break barriers and authors that write relevant stories. Topics such as LGBTQ romance, science fiction, action, drama, memoirs and non-fiction intrigue them. Regal Crest only accepts completed manuscripts electronically. Writers and authors must attach their complete manuscript via email after reading the guidelines. A traditional small press publisher Dreaming Big Publications wants the unpublished, new authors as well as the published authors to come collaborate with them. Dedicated to finding and printing the next big book, they believe in encouraging good writing instead of gimmicks and fads. Authors and writers are offered personalized attention and a partnership during the editorial, marketing and promotional process of the book. Dreaming Big has no restraints on the genres they accept and are welcoming of fiction, non-fiction, memoirs and self-help books. Memoirs of people who have been failed by the justice system or suffered from addiction or of LGBTQ people are appreciated. The guidelines for US based authors are listed here. They prefer working with authors residing in US so if you aren’t a citizen; mention so during submitting the manuscript. Use the contact form to submit your query letter. Christopher and Michele Robbins launched Familius in 2012 to use their combined experience of publishing, media in printing and promoting family oriented, positive books and stories. Using the family as the central unit around which all relationships revolve and develop, they bring their love for family, love and support to the table even with their authors. Stories that empower, brighten and enliven the daily lives of readers across the world are preferred by Familius. They print in both digital and traditional formats. They are seeking books about parenting, education, marriage, memoirs and young adult fiction. You can read the guidelines on this page. Use the online submission form to send your manuscript and proposal to the Sanger based publisher. A traditional publisher with an unconventional focus, Stone Pier Press is using books to save the world. They call themselves an ‘environmental publishing house’ with a focus on food. Stone Pier Press uses literature to share the stories about environmental concerns such as food production, sustainable methods of farming and living, technologies to save nature and climate, alternative solution to harmful and wasteful practices among other vital issues. The San Francisco based publisher partners with local charities, organizations, businesses and non-profits to debate and tackle green causes. Writers can send guidebooks, memoirs and children’s books about clean eating, environment, green living and sustainable methods. The guidelines to submit your proposal can be found on this page. Use the Submittable link to send your manuscript or proposal. Located in New York, Diversion Books was formed in 2010. Working towards publishing 50 books a year, Diversion is an ideal blend of the traditional and modern. It uses both digital and print formats to publish the books chosen carefully by their editorial team. Bent on finding relevant, poignant and stellar voices in literature, Diversion combines the best marketing, editorial and promotional strategies to push your book in the industry. The publisher is looking for business, self-help, memoirs, biographies, fiction and young adult. They may not reply to submissions done without an agent but that’s only in the case of the book getting rejected. Selected authors and writers can expect to hear within 2 months. Send a query letter along with the first 3 chapters of your book pasted in the body of an email. Writers are also supposed to outline a marketing plan or ideas in the body of an email. Any attachments will not be opened or considered. Do you know of any other publishers looking for memoirs? Tell us about them in the comments box below!